The home of Doreen Fletcher, artist and chronicler of East London life, and her husband Steve Copas, can be found in a terraced row of Victorian houses that ends abruptly on the edge of Wanstead Flats. It makes sense, somehow, for her home to be on the edge of somewhere – for she is an artist of liminal spaces, buildings about to disappear or places that seem to be waiting, breathlessly, for something to happen. The interior of the house, which was built in 1875 and only had four owners since then, is very much Victorian, but with all the art on the walls and bright ornaments that you’d expect from an artist’s home. It feels warm and lived-in. Upstairs, her studio is a more austere space but very bright thanks to the skylights set into the attic roof, making the most of the natural light. It is full of her own canvases, some by other artists, postcards and art books. The route which has brought her to where she is now, a respected and accomplished artist, has been a circuitous one. Born in 1952, she grew up in Stoke-on-Trent, the only child in a working-class family. ‘ My parents did the very best they could for me. I remember, when I was five, they bought me a set of encyclopaedias from a door-to-door salesman. It had colour pictures in it of paintings, the first I had ever seen such as ‘The Hay Wain’ by Constable and ‘The Fighting Temeraire’ by Turner and I thought they were wonderful’, said Doreen. She remembers her dad taking her to the local toy shop and pestering him for the most expensive crayons in the shop, much to the amusement of the shop’s owner. She loved drawing as a child. After doing A levels at the local grammar school in Newcastle-Under-Lyme, she did an Art Foundation Course moving to London in 1972 because ‘that was the place to be as an artist’. To make a living she worked as an art school model for a while then enrolled on a College Diploma Course (at Croydon). She didn’t really take to formal art education, preferring to be independent and go her own way, rather than conforming to a ‘house style’. Her move to East London in the 1980s came about as, like many artists, she was looking for more space. With the demise of the London Docks, warehouses were converted to other uses, providing ideal studio space for artists, and there was also a lot of empty housing stock awaiting clearance, a programme favoured by the GLC. She relocated to a ‘short-life’ Victorian house in Clemence Street, Poplar. 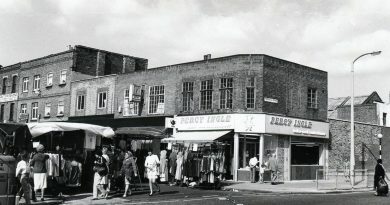 There were whole streets in Poplar, Stepney and Bow awaiting re-development and inhabited by artists in those days. ‘I was excited by being somewhere that was in many ways similar to the area where I had grown up’, she said. 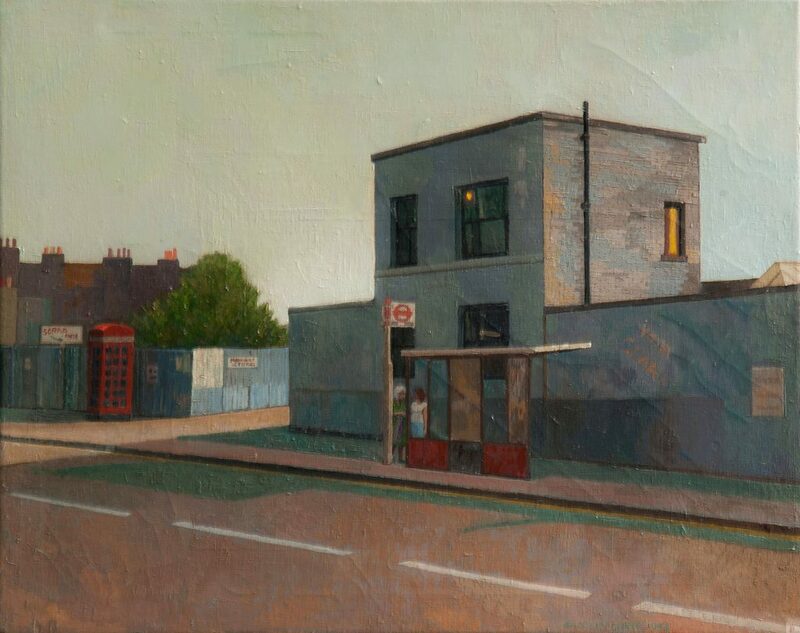 Her first East London painting, Mile End Bus Stop in 1983, and one following immediately after, Mile End Park at Twilight, explored this haunting light. In Mile End Bus Stop some lights are on in the house and the shadows seem low; perhaps it is evening. Two women wait at a bus stop. An empty phone box stands nearby. It’s a scene that is at once mundane and at the same time strangely melancholy. She does not like to talk a great deal about influences, but in her studio, she has a much-thumbed catalogue of paintings by Edward Hopper and the urban alienation he depicts definitely has its echo in her work. Other influences she talks about are the work of Eric Ravilious (1903-1943) and Potteries artist Jack Simcock. ‘He painted the dour, bleak village of Mow Cop on the edge of the Peak District inspiring my interest in the architecture of the ordinary’. 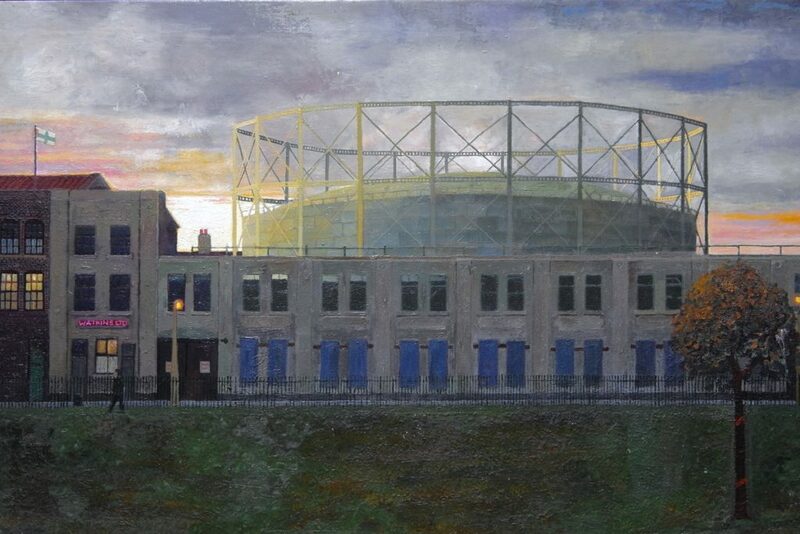 In Mile End Park at Twilight, it’s evening and the artist wants our eye to home in on the dramatic sunset and the sky above the park, deserted warehouses and looming above them, the gasworks. A patch of light illuminates NatWest Tower (as Tower 42 was known then) in the background. A street lamp is also shining as are some interior lights in the buildings facing us, and a solitary walker enjoys the spectacle from the darkening park. It’s a layering of old and new, commerce (the tower), industry (the disused gasworks) and finally the typically abandoned East London warehousing housing in the foreground behind which lies the Grand Union Canal. 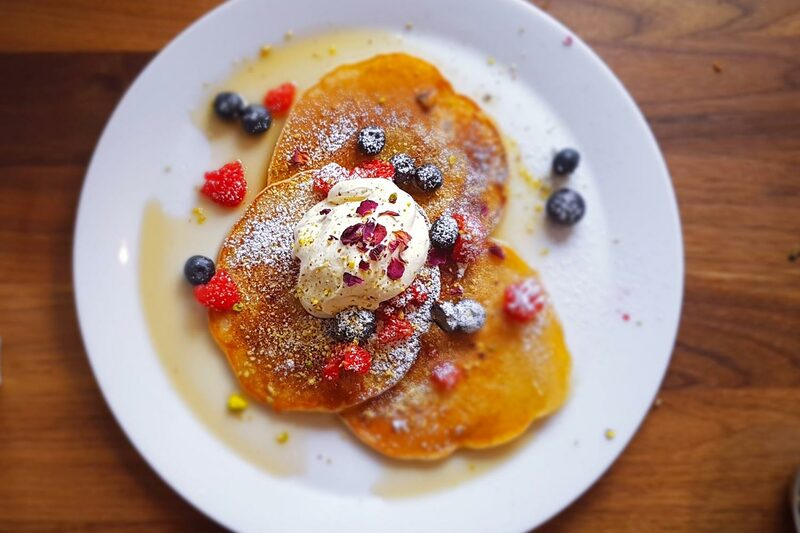 She settled into East London life very quickly. 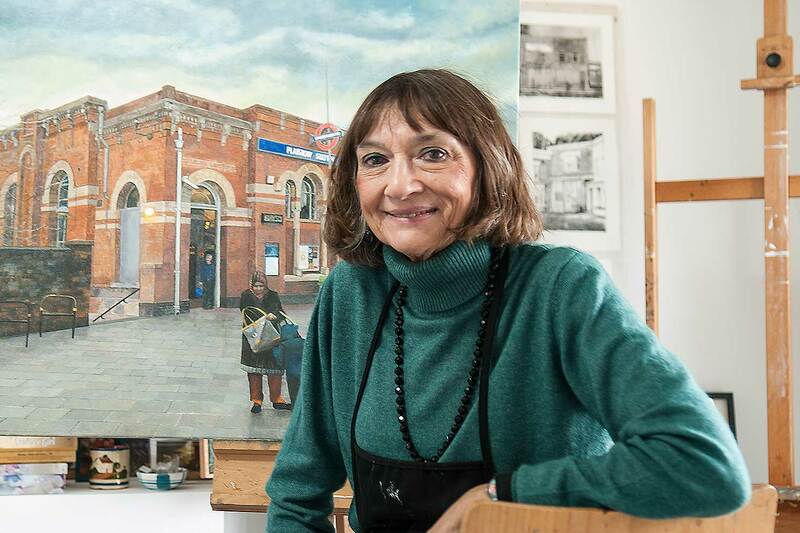 She remembers shopping at the French Connection market stall on the Roman Road and buying her fruit and veg there in the 1980s, when she used to model in the area and return home at midday to paint (‘I never wanted to be a Sunday painter’). 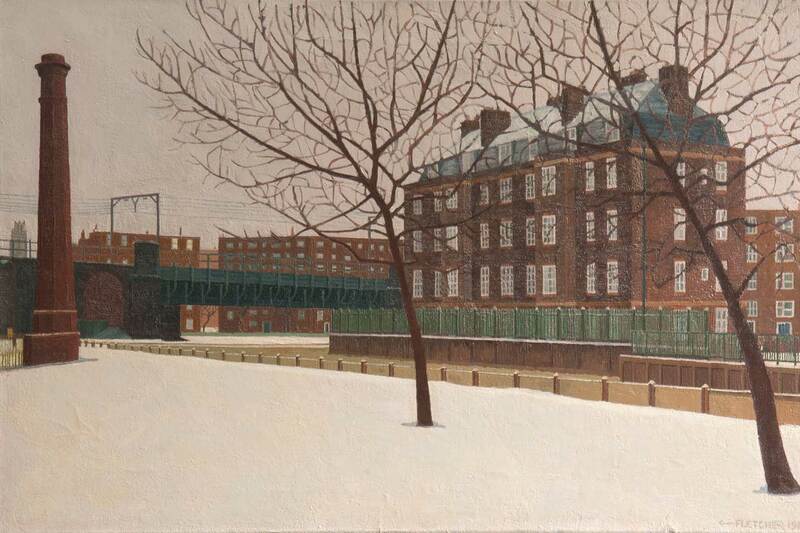 Most of her work focused on Stepney, Bow and Poplar also encompassing the canal between Limehouse Cut and Victoria Park and the river around Wapping. The East End was changing in front of her eyes, she recalls. She continued single-mindedly with her work, self-funding with modelling and teaching jobs, but received very little critical attention as an artist, although she exhibited locally and had a loyal group of buyers. By 2004, she’d had enough. ‘By this time I had been teaching art part-time to SEN students in further education for twelve years. What I was painting became out of fashion, as did the act of painting itself due to the growing interest in conceptual art. 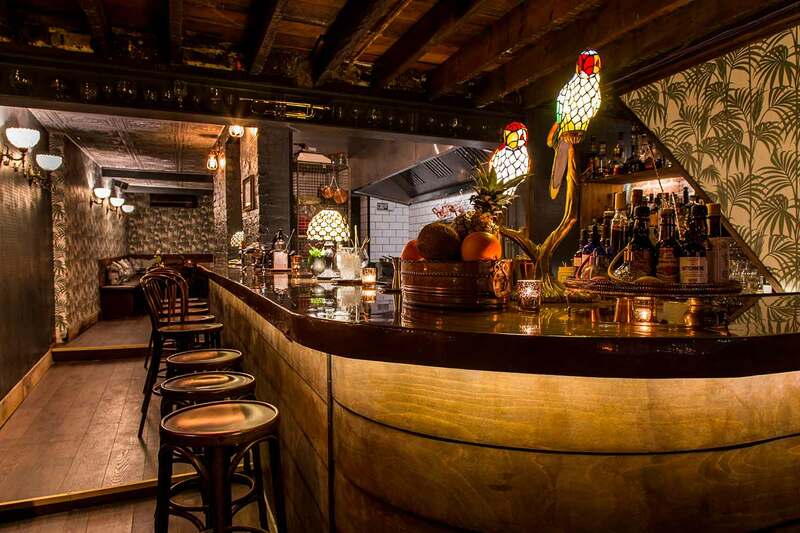 It became more and more difficult to find venues that would accept my form of representation and objective realism’. She grew more interested in the educational aspect of her life because she had good communication skills and importantly, her teaching work was appreciated. When she was offered a managerial position in 2004, she took it, packing away her paints. 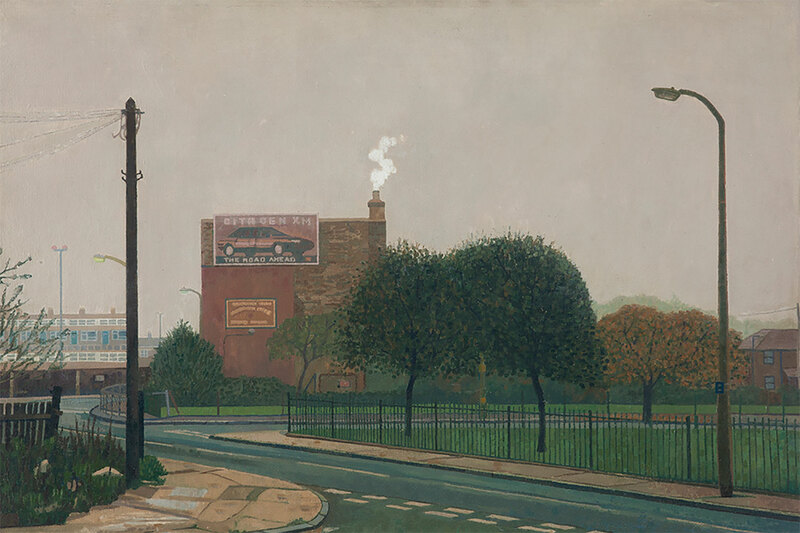 If it hadn’t been for the Gentle Author and his interest in her work, which brought it to a new audience, the East London paintings might never have seen the light of day again. Although by this time, she had started working as an artist again, it was the Gentle Author who persuaded her to revisit these paintings. 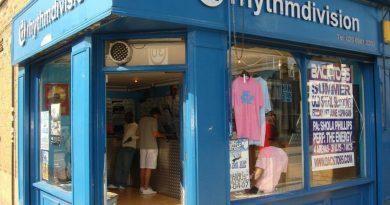 ‘I am very appreciative of being discovered by the Gentle Author and subsequently given a tremendous amount of support and promotion by both him and Fiona Atkins of the Town House to the extent where I feel truly part of a community… but the art establishment continues to ignore me as they do the East London Group. I am a little disappointed but not surprised’. Things are changing, however. Her exhibition of new work at the Town House Gallery, In Between, Almost Gone in 2017 was a great success following on from a previous exhibition of East London paintings in 2016 (1983-2003) called ‘Lost Time’. She was also shortlisted for the inaugural Evening Standard Contemporary Art Prize in 2017. She is about to have a solo retrospective show at the Nunnery Gallery and the Gentle Author is bringing out a new book about her later this year. 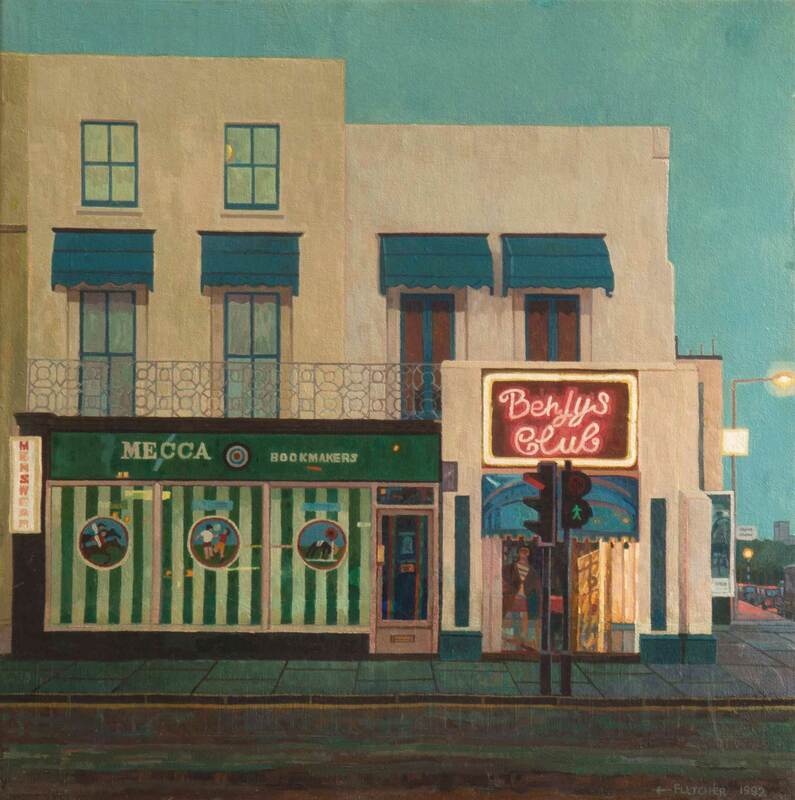 Other publications are ‘Lost Time’ written by Fiona Atkins, which documents the area’s history and a contemporary journey through the locations of Doreen’s paintings and also East End Vernacular, written by the Gentle Author about East London artists of 20th century. She is a poster girl for determination and resilience. She has survived throat cancer and as her husband commented during the interview, she never complains about the difficult side effects of her treatment. She has returned to college (the University of East London) as a mature student and just finished her MA in Fine Art. Meanwhile, she has returned to painting the East End as well as France, where she also now has a home. ‘I transferred to East London, the areas of Bow, Poplar and Stepney that I had haunted in the eighties and nineties. 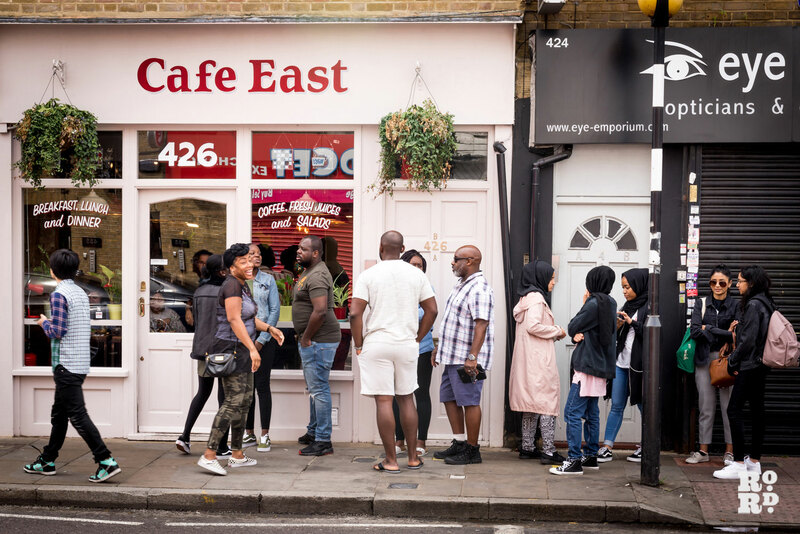 I was delighted to discover that much remained, that determination of the East Ender to survive and thrive in the face of adversity was alive and well. The difference being that this time I feel I am painting as a participant, not as an observer. For I too am a survivor!’. I live in Johannesburg, South Africa. Here our ‘Architecture of the Ordinary’ is plentiful, and falling into spectacular ruin. I am not sure that anyone has ‘seen’ the city in the same way that Doreen Fletcher sees the East End of London. I shall definitely be looking at the buildings with a new eye, having seen Doreen Fletcher’s work! Best of Luck, Doreen. 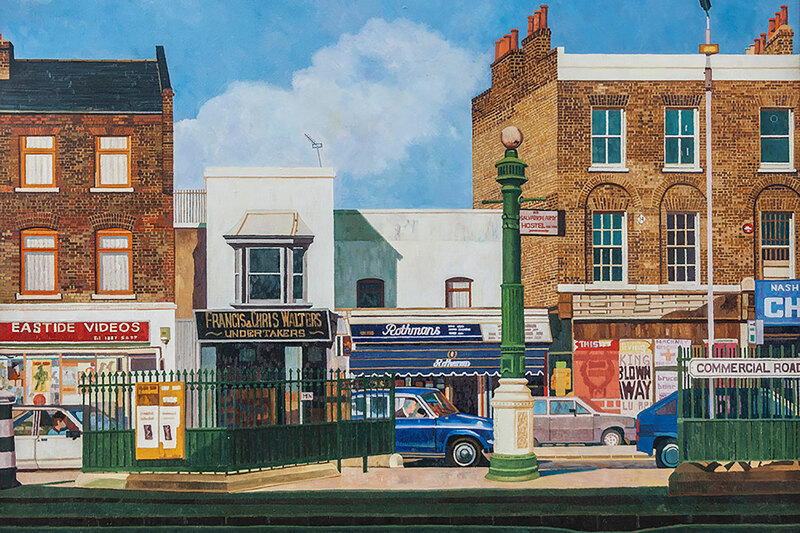 Rather like Canaletto, though without all the figures, Doreen Fletcher gives us a strong sense of place by her meticulous rendering of detail, of truth plus something more. Of course her paintings are a record of a lost or disappearing world, but there’s much more – a range of moods and feelings, often signaled by skies or vegetation or time of day. And it’s never raining…..